Every year for Thanksgiving, I make some sort of cheesy spinach dip. 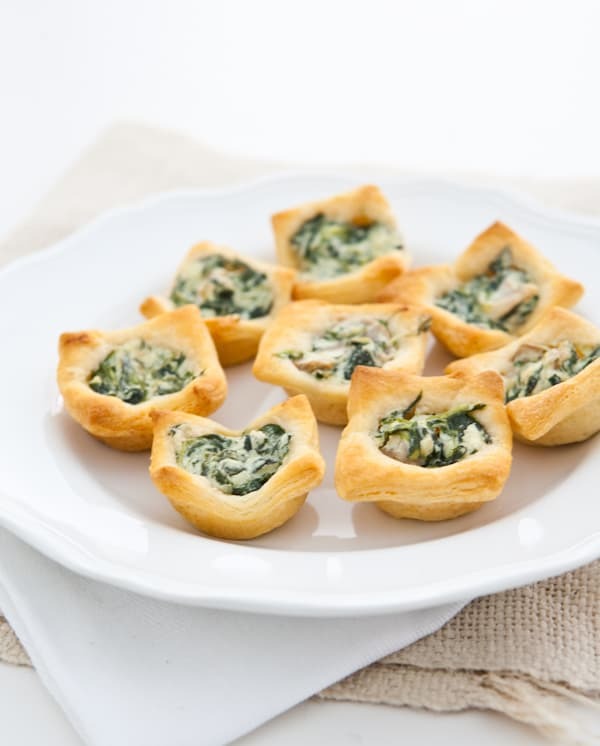 Spinach artichoke, spinach mushroom and sometimes spinach with sun-dried tomato are on the menu. This year, I wanted to make my ordinary dip a little fancier than just baking it in a casserole dish. So I used some Pillsbury crescent roll dough, and made these cute little bite-sized appetizers filled with a creamy, cheesy mushroom spinach filling. I simply cut the dough into small squares and placed the dough into a mini muffin pan that I sprayed with nonstick cooking spray. For the filling I used sautéed mushrooms and spinach and combined it with cream cheese, Parmesan cheese and fresh basil. Then I spooned the filling into the pastry and baked them until golden brown. Heat oven to 350°. Roll out crescent roll dough and press together the diagonal seems. Cut dough into 32 equal squares. 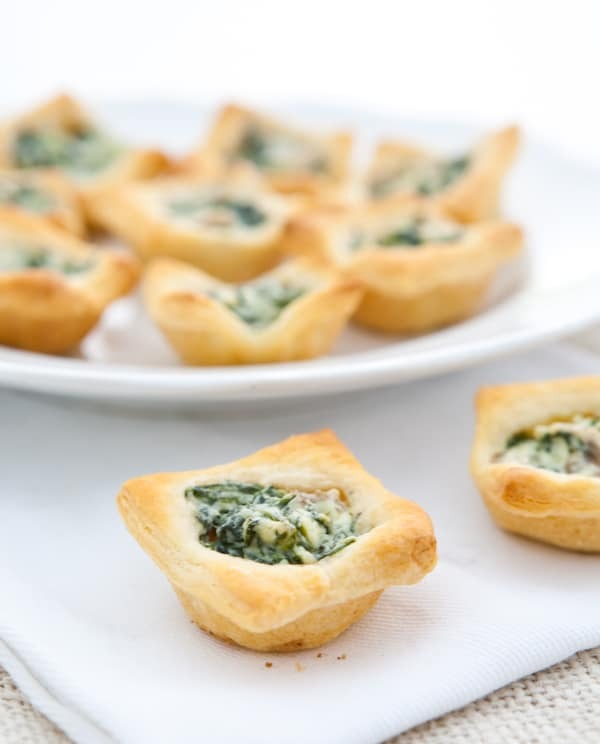 Place small dough squares into a mini-muffin pan that has been sprayed with non-stick spray. Drizzle a pre-heated skillet with olive oil. Add chopped spinach, mushrooms and garlic. Saute until mushrooms are tender and spinach has wilted. Remove from heat and add cream cheese, Parmesan and basil. Mix well. Add 1 heaping teaspoon of filling to each crescent roll dough square. Bake at 350° for 15 - 20 minutes, or until golden brown. Tip: For even more flavor, add 1 tablespoon freshly chopped basil and 2 cloves garlic, grated. Tip: I used a very small muffin tin. Depending on the size of your mini muffin tin, you may choose to cut the dough into 16 instead of 32 squares. Love these! 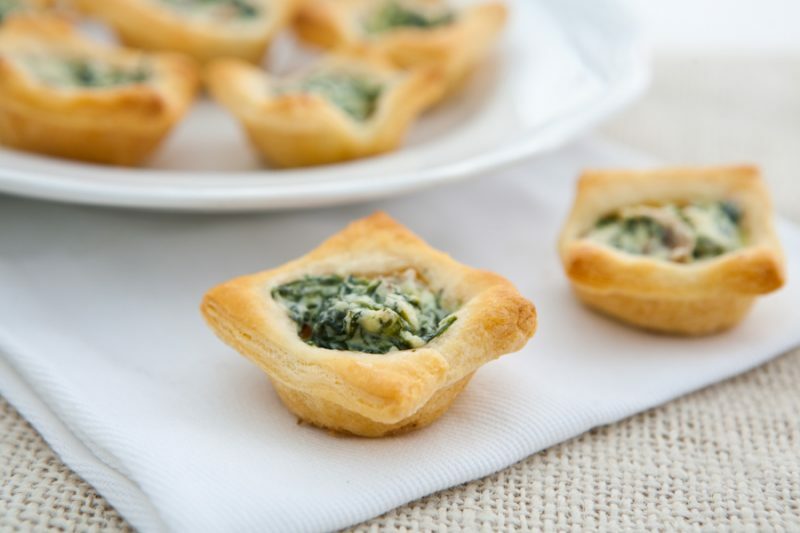 A perfect holiday appetizer. I love how simple these are. Too cute! Simple and delish. My family loves those Pillsbury crescent rolls – I know these would disappear FAST! These are so delightful!! Great for the holiday table! I could totally gobble these up in a hurry! Yum! Looks like the perfect little bite. I may have to add these to our Thanksgiving menu! Oh my goodness! I wish I didn’t already have 1000 things planned to take to my family Thanksgiving dinner!!! This one’s getting printed for Xmas! How much Basil did you use in your recipe? I put it in the tips, 1 tablespoon fresh. Beautiful and simple! Now these are my kinda treat! I’m absolutely using this recipe over the holdays 😉 Thanks for sharing!